USA 2 Ghana 1: SUPERPOWER SUPERPOWER USA! SUPERPOWER SUPERPOWER USA! On the balance of play the USA were not exemplary, with Ghana picking apart the USA through DeMarcus Beasley’s inadequacies at left back and the midfield being completely overwhelmed. The second half itself made the disparity between the two teams even more profound. Ghana for the first half relied very heavily on crosses into the box and attacking DeMarcus Beasley’s side (we’ll get to that shortly), only completing 41 of 66 attacking third passes. At one point, one could’ve made the joke that David Moyes was coaching the Ghanaian national side in a costume with how comical the attacking ideologies were. Ghana though found an extra gear in the second half and if it wasn’t for bad shooting %’s, Ghana would’ve gotten a result vs the Americans. I touched upon in Brazil’s victory over Croatia about game states and how teams can react differently according to the score line. The US played very much like a team protecting the lead, resorting to some semblance of a defensive shell while Ghana attacked wave upon wave. However for American fans that won’t matter. John Brooks made himself an American hero, creating another monumental moment in USA football history alongside Landon Donovan’s game winning goal versus Algeria in the 2010 World Cup. He’s the first substitute to ever score for the US in the World Cup, and the three points gained versus Ghana are huge with their big ticket showdown versus Portugal next up. 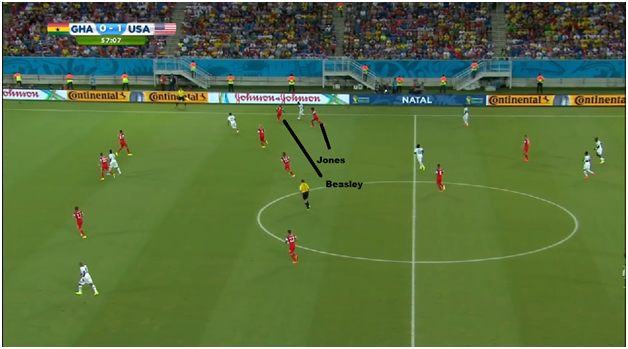 The second instance in particular was one where the US gave no help to Beasley on his side, especially Jermaine Jones who had his problems giving Beasley help with Atew with his tendencies to stay inside while leaving Beasley on an island. 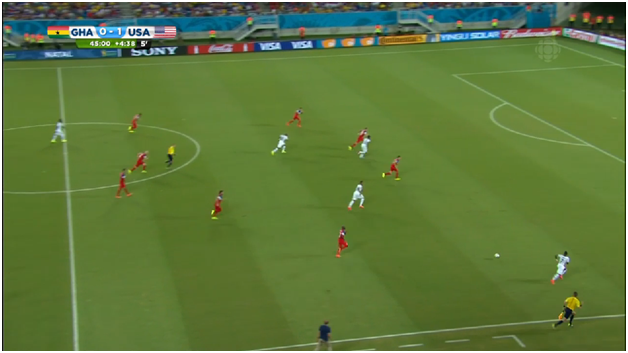 Again, Beasley was helped a bit by how bad the crossing was on Ghana’s side but on another day, maybe those crosses hit their intended target and Ghana create even more clear cut chances. The theme continued in the second half with Atsu continuing to make runs in behind the two. With Portugal as their next match and USA having to deal with the enigmatic Nani, tactical stability will be key, and Jones simply not cutting inside and exposing Beasley on the flanks would help in that department. 73% passing on just 201 passes. Just 88 passes completed on 69.8% completion in the second half. For how inaccurate Ghana were at having their shots test Tim Howard, they did a very good job at pressuring the US and making Michael Bradley an insignificant part. Ghana pressed when the opportunity seemed right, and forced the US into hopeless lobs and long passes to catch Ghana off guard. The US also were just sloppy as well. I’m not sure the main reasons as to why this was happening. Sure Ghana pressed the Americans but teams should be able to compete with that, especially a team with the supposed pedigree that the USA have carved. Bradley did complete 81.3% of his passes on the night and tried to help out the back four even though the formation dictated that he would play behind the front two, but it he didn’t have much of an impact to the naked eye. Beasley was a non factor along with Jones while Fabian Johnson had his moments here and there but ultimately was in the same boat with Bradley. Perhaps the injury to Altidore set the wheels for Ghana’s attack as the US had a relative hold on the match until his unfortunate hamstring injury. Look the game wasn’t favorable at all for the US but the most important fact is they got the three points. John Brooks found himself the lucky recipient of some odd Ghana marking in the box to make himself the new hero in the World Cup. Altidore’s injury is concerning and might not be in the lineup for the two remaining group stage matches versus Portugal and Germany, but the USA with their win have reminded us that they’ll find a way to claw and fight their way for a result. US soccer has made huge strides in the past handful of years but one thing that hasn’t been forgotten is inner belief, and however it may make analytic’s types like myself groan, it matters on some level and the USA proved it tonight. This entry was posted in Analytics, FIFA World Cup, Tactics. Bookmark the permalink.